Here’s a little joyous addition to your Labor Day grilling if you want something new! Our dear friend, Shannon, who has been with us through all kinds of culinary adventures over the past 10 years as our most enthusiastic taste-tester, came up with this awesome idea. We were sitting at our favorite restaurant in Lubbock, Crafthouse Gastropub, enjoying one of their creative appetizers, the fried deviled eggs, when the idea came to her. This dish is pure genius: hard boiled eggs, fry the whites in a crunchy batter and then serve the little fried egg halves with deviled egg spread so you can put as much as you want on your egg. So crunchy and amazing! 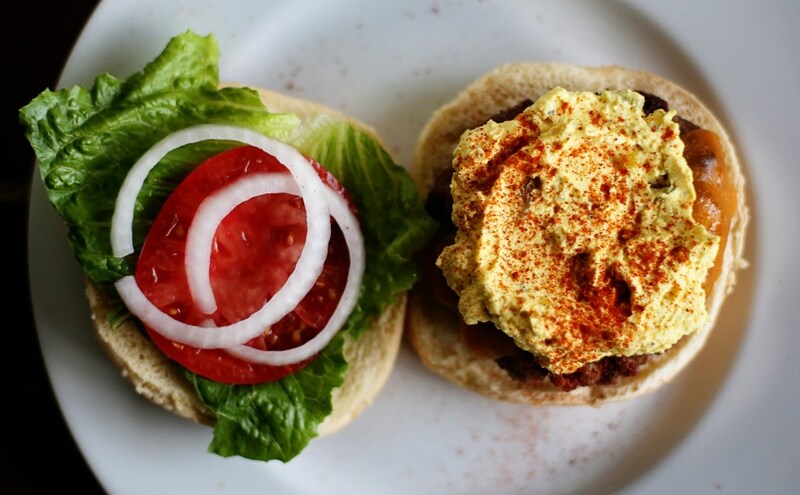 As we were enjoying the dish, Shannon said, “This would be so good on a burger.” And we all sat in silence for a second and let it sink in that deviled egg filling would indeed, be the best burger spread, ever. Imagine the goodness of mayo, mustard, pickle, the tang of vinegar and the creaminess of the ever-popular-fried-egg-on-a-burger-trend, all combined into one spread for your burger. It TOTALLY works. 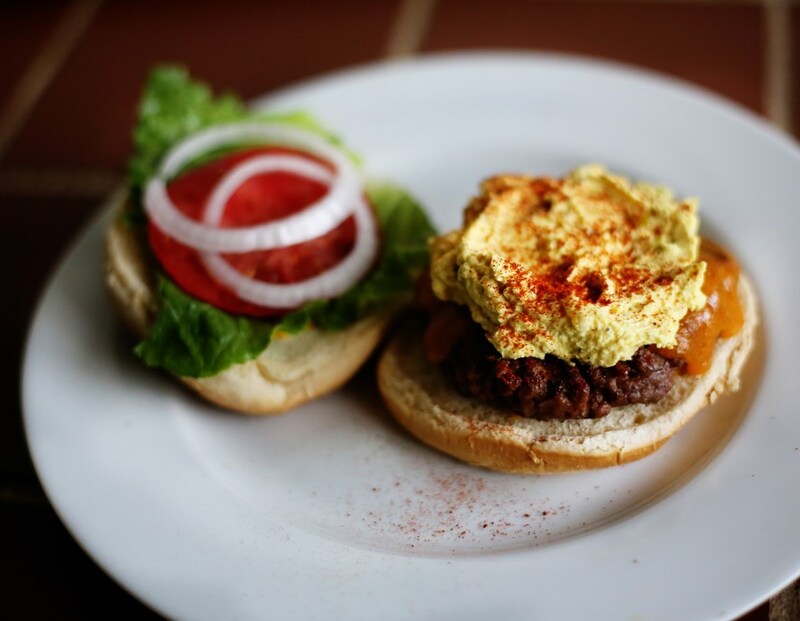 So, I just whipped up a very traditional deviled egg mix and added the basics and it has been my favorite burger of the summer! If you want to try it, a dozen eggs yields enough for about 6 burgers as a spread. So cut it in half if you don’t have all deviled-egg enthusiasts at your party and see how you like it! Thanks, Shannon, for being our partner in culinary crime 🙂 We love you! Hard boil the eggs by bringing all dozen up to a boil (start them in cool water) and once it reaches a boil, remove from heat, cover, and let sit for 12 minutes. Drain, rinse in cold water and peel. The glory of this dish is that you don’t have to keep those fussy whites in tact. If they fall apart, they fall apart. If you don’t want to waste the whites, I’m sure you could crumble them up and incorporate them in this recipe as an egg-salad kinda thing. Do what you wish. In a large bowl, add all the yolks and the other ingredients and mash well with a potato masher or whisk until smooth. Adjust with extra mayo or mustard as you wish – really, I eyeballed this mixture, so I may have had slightly more of something, but these approximations are fairly close to what I did. Spread on burgers, sandwiches, etc, and enjoy! 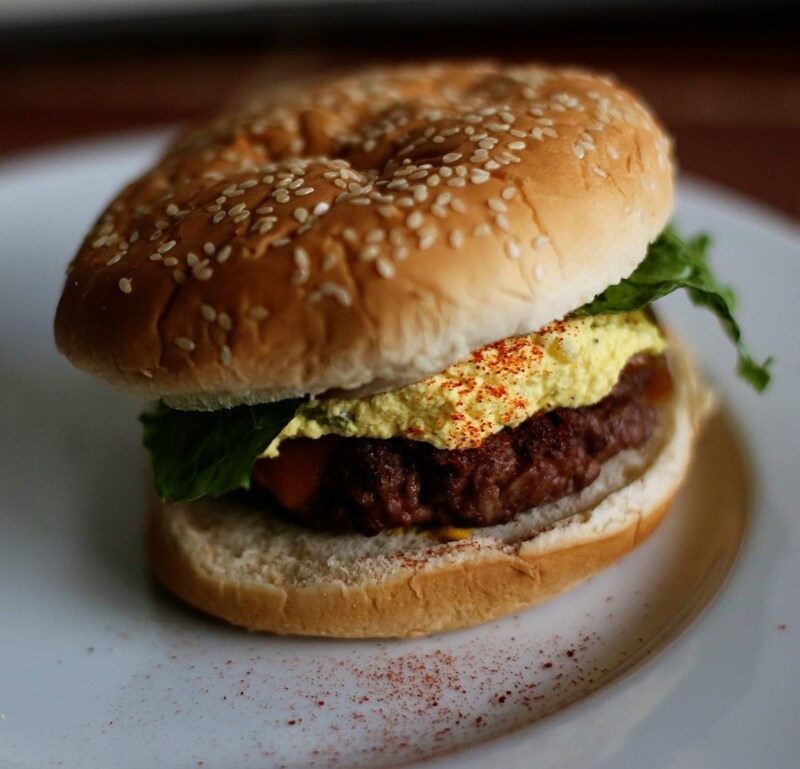 This entry was posted in Dips, Eggs are Awesome, Superbowl, Uncategorized, Weekend Fare and tagged burger recipes, burger spread, burger toppings, burgers, deviled egg spread, deviled eggs, Labor Day recipes, Labor Day weekend recipes, outdoor grilling recipes, unusual burger toppings. Bookmark the permalink.